The Pilot's Watch Chronograph enriches IWC's collection as a pilot's watch with a stopwatch function. A clear, functional design defines the look of this stainless steel watch with a black dial, and its movement is protected from magnetic fields. IWC has been making watches designed for the field of aviation since 1936. The so-called special pilot's watches were the first watches developed for this purpose. The watches were designed with a black dial and large, luminous Arabic numerals, making it easy to read even in the dark. One special feature was a rotatable outer ring with a triangle marking the flight departure time. The ring helped the pilot keep track of fuel consumption based on how long the plane has been in flight. Back then, not every airplane cockpit had an instrument for tracking fuel use. The electrical systems of planes produce strong magnetic fields; therefore, these special pilot's watches were protected against magnetism. Magnetic fields make the timepiece less precise, as the escapement and balance wheel are sensitive to such disturbances. The principles behind these special pilot's watches from 1936 are still present in the Pilot's Watch Chronograph today: It's optimized for legibility; all important information is easy to read, even with three subdials. The movement is shielded against magnetism by a soft-iron cage. The pilot's watch chronographs have a diameter of 43 mm - not especially small, particularly in combination with a thickness of 15 mm. The black dial features Arabic numerals, large sword hands, and clear stick indices. Characteristic of pilot's watches, there's a triangle at the 12 o'clock position. Numerals, hands, and markers are white in order to create maximum contrast with the dial. Two push-pieces and three subdials make it immediately obvious that this is a chronograph. The subdial at nine o'clock is for the small seconds and the subdial at 12 o'clock is the 30-minute counter. Beneath it at six o'clock is the 12-hour counter. The bright red seconds hand on the small seconds subdial is the only touch of color. However, this only applies to newer versions of the watch; older versions have a white small seconds hand. Two windows are located at three o'clock, one for the day of the week and one for the date. The case back is made of stainless steel. Luxury watches often have clear sapphire glass case backs to allow you a view of the movement at work. However, a glass back sacrifices protection against magnetism. Therefore, IWC forewent a see-through back. Yet what they did instead is still attractive: The case back is engraved with the image of a Junkers Ju 52 plane. The Junkers Ju 52 was a plane with three engines that revolutionized aviation in the 1930s. The cockpit instruments from this area served as a template for pilot's watches' design. Furthermore, the case back indicates that the watch is waterproof to 60 m, equal to 6 bar. Are you searching for a large watch with a simple cockpit design and a stopwatch? The Pilot's Watch Chronograph has what you're looking for. It's made by one of the most well-known Swiss luxury watch manufacturers, the Schaffhausen-based International Watch Company (IWC). 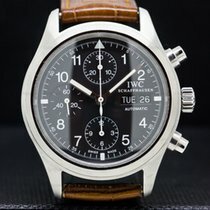 The current pilot's chronographs from IWC (reference number IW377709) cost around 4,000 euros new. Over the years there have been a number of different versions, such as watches with gold cases and quartz movements. These cost between 6,000 and 8,000 euros. Older stainless steel quartz models can be purchased for around 2,000 euros. Mechanical models from before 2016 (reference number IW377701) can be identified by their extended date display. The window displays not only the current date, but also the dates of the previous and next days. The top number displays the next day, the middle number the current date, and the bottom number represents the previous day. The hour indices from 1 to 11 are on the edge of the dial along with the minute track, which goes from 5 to 55. IWC went in a different direction with the subsequent models, stripping the newer ones down to the essentials. Watch enthusiasts will already have an idea of which base caliber powers the Pilot's Watch Chronograph thanks to the subdials at six, nine, and 12 o'clock. The Valjoux 7750 has been the go-to base chronograph movement for many different companies since the 1970s. The caliber is made by the ETA SA Manufacture Horlogère Suisse (ETA) and is the base for the IWC caliber 79320 used in the Pilot's Watch Chronograph. The movement is extensively reworked, as IWC has stricter standards than ETA. The 79320 vibrates at 28,800 alternations an hour, has 25 jewel bearings, and a power reserve lasting 44 hours. IWC was already considered one of the leading Swiss luxury watch manufacturers before they developed their pilot's watches. However, the early years were difficult. Florentine Ariosto Jones (1841 - 1916), an American from Boston, founded the International Watch Company in 1868 in Schaffhausen, Switzerland. His plan was to produce watches in Switzerland at a lower price and then sell them for a profit in the USA. However, he ran into problems since the import tax in the USA was too high. After repeatedly changing owners and going bankrupt twice, IWC landed in the hands of the Rauschenbach/Homberger family in 1880. Once the Quartz Crisis hit, the family had to give the company up in 1978. Since 2000, the company has been part of the Richemont Group, which also owns Panerai and A. Lange & Söhne.